Hands-on field instruction as well as short classroom sessions will help to build your photographic skills while surrounded by amazing forests filled with birds, butterflies and more! Trinidad, only seven miles off the coast of Venezuala, contains an abundance of species found in northeastern South America. Tobago’s avifauna is more Caribbean in it’s makeup. In Trinidad we’ll visit the world-famous Asa Wright Nature Centre, a charming lodge located in a 2,000 acre tract of rainforest high in the Arima Valley of the island’s Northern Range. Visitors usually see more than 40 species of birds before breakfast. Incredible birds, awesome accommodations and relaxing birding will surely combine to make this a trip of a lifetime! Day 1 – Arrival at Port Of Spain / Asa Wright Nature Centre. Days 2 through 6 – Hands-on Photography instruction at Asa Wright Nature Centre. Day 7 – Return to Port Of Spain / Return Home. Day 1 – Arrival/Asa Wright Nature Centre. Arrive in Port of Spain (POS). Centre guides meet Transfer to Asa Wright Nature Centre, about an hour’s drive. Photographing from the veranda of the Asa Wright Nature Centre is one of the world’s most invigorating ornithological experiences. Hummingbirds perch quietly at arm’s length and buzz past your face like fighter jets mid-dogfight. 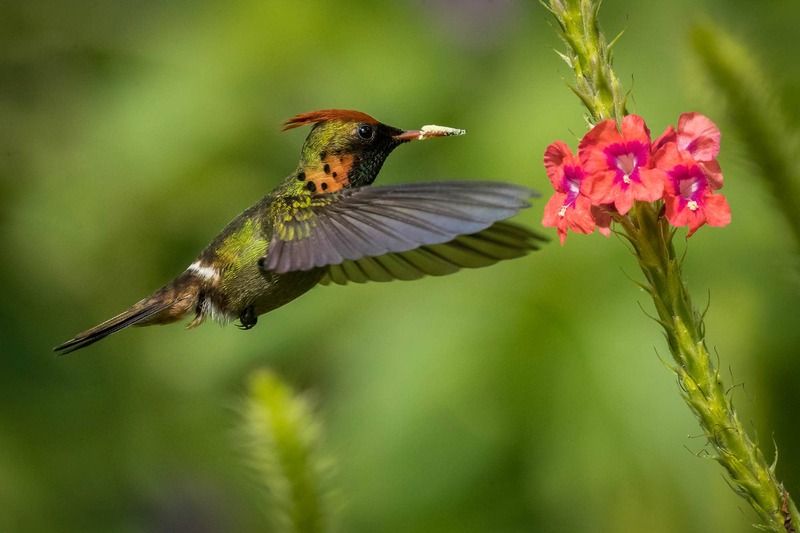 Ruby-topaz Hummingbird, Tufted Coquette, Barred Antshrike, and both Purple and Green Honeycreeper are among the species seen at flowers, fresh fruits, and feeders below. Days 2 through 6 – Asa Wright Nature Centre. Hands-on photo instruction will take place anytime we are in the field. Each day at Asa Wright will offer fun photographic challenges as we learn more about capturing images of hummingbirds, orioles, motmots and so much more! A typical morning begins with the raucous calls of Crested Oropendola and a host of other exotic sounds. Pick a spot on the veranda and spy as many as 30 life birds before breakfast! Coffee and tea are available at 6 a.m.
First arrivals to the feeders often include the endemic Trinidad Motmot, Cocoa and Spectacled Thrushes, White-lined, Blue-gray and Palm Tanagers, alongside the energetic Bananaquit. Busy feeders at eye level attract dazzling White-chested Emerald, Blue-chinned Sapphire, White-necked Jacobin and Copper-rumped Hummingbird. Mid-day we will discuss the mornings opportunities and learn what we can do to improve upon our images and technique. In the afternoons we may enjoy more opportunities at the feeders or explore elsewhere for Fork-tailed Palm-Swifts, Sulphury Flycatchers and Moriche Orioles. We may even come across White-faced Capuchin or Red Howler Monkeys! You return to Port of Spain in Trinidad to meet up with International flights; departures are timed accordingly. Cost is $3,450 per person, based upon double occupancy, from Port of Spain, Trinidad (Airport code POS. This trip ends in Port of Spain, Trinidad (Airport code POS). If a single room is preferred, or we are unable to find a suitable roommate for you, a single supplement fee of $450 will be assessed. Birding from the veranda of the Asa Wright Nature Centre is one of the world’s most invigorating ornithological experiences. Hummingbirds perch quietly at arm’s length and buzz past your face like fighter jets mid-dogfight. Ruby-topaz Hummingbird, Tufted Coquette, Barred Antshrike, and both Purple and Green Honeycreeper are among the species seen at flowers, fresh fruits, and feeders below. This is an easy trip, however, a couple of -optional- trails can be slippery and rocky as well as up and down.